This is from the latest newsletter of the Nevada County Arts Council. Our magazine published the inaugural Nevada County Artist & Gallery Guide last month. It coincides with the summer issue of our magazine, a special report on the state’s new “Cultural Districts.” We rolled out the news that Grass Valley-Nevada City and Truckee were among the 14 districts selected statewide by the California Arts Council. 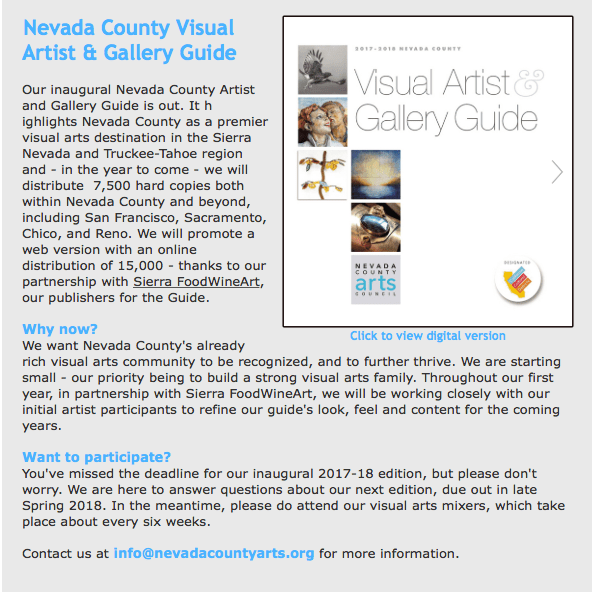 A link to the digital version of the Nevada County Artist & Gallery Guide is here. Next Next post: Novato High plans to drop varsity football: Will it become a trend?